Yes, this scruffy mental oriental sold £85,000,000 of new cars in the UK in 2015 - unbelievable, but quite true. Hello! 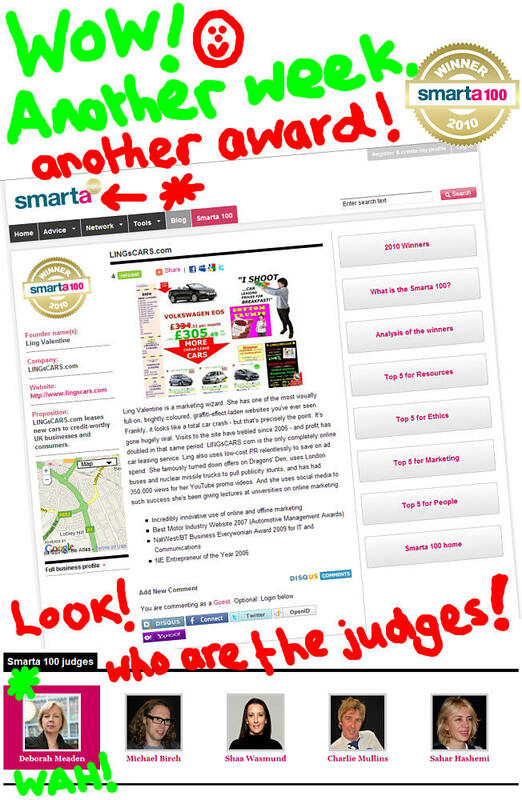 I'm the UK's hardest working car leasing provider, and I run LINGsCARS, the UK's favourite car leasing website. Don't be deceived... 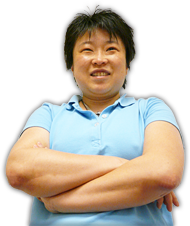 I may be a scruffy Chinese girl, but I have more happy new-car customers and supply more new cars than many of the anonymous (and some big-name!) leasing companies out there, combined. I treat customers like adults, not like idiots. 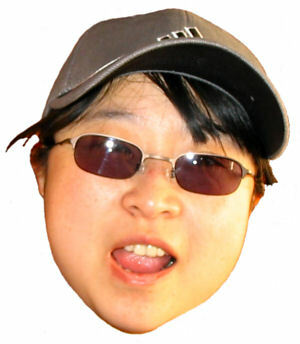 Interesting name Ling, where are you from? I am full-time LINGsCARS business owner and I specialise in supplying new UK Contract Hire, (and sometimes PCP, Lease cars and Lease Hire) cars and vans. 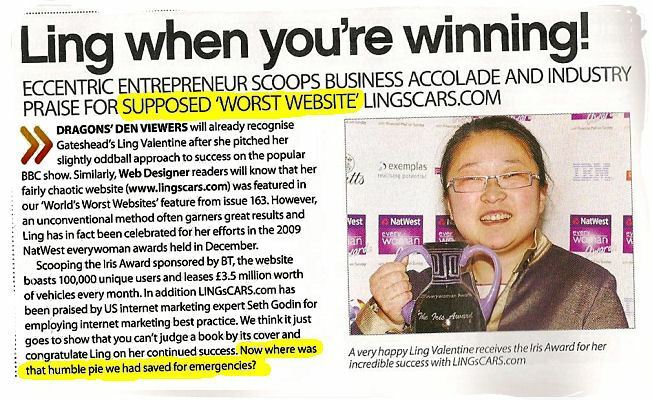 LINGsCARS consumes my life to make it a very successful business. In 2008, I moved over £35,000,000 of brand new cars! Do you still visit China? Yes, my family is mostly in China. My mum and dad still live in Chengdu, Sichuan, and I go back at least once every year. China is coming on, you know! Although the political situation is rotten, it's stable and my family have a good life. My mum's a famous dentist (over 70 but still working! ), and my dad used to work for the government in the Environmental Service, but he's retired now. 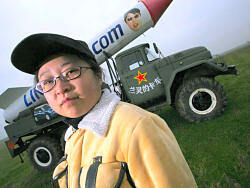 My sister Shan works for the Sichuan Poverty Relief Office, but in the Cultural Revolution, she used to be a red guard! I'm too young to have been involved in all that rubbish. China's quite polluted, and not as green as the UK... plus there are so many people everywhere there. Life is more pleasant here...and I've been naturalised now. I guess that makes me Chinglish. I am a successful immigrant at least! I did it legally, and I have succeeded. That puts a smile on my face. Where did you learn your contract hire car sales skills? My husband set up Caledonia Contracts, then established Arena Contracts in London before he went to work for himself. He was very successful, so I learnt the business and took over the reins. I must say I'm better at it than him! The key to this business is efficiency. This means that I give a very good personal service, I have very few overheads to add to the cost of the cars, plus I have a fully computerised system that I built myself, that I am developing all the time. Computers and databases are my hobby. I live on the internet. I consider myself to be the equivalent of Ryanair, in the Contract Hire business. 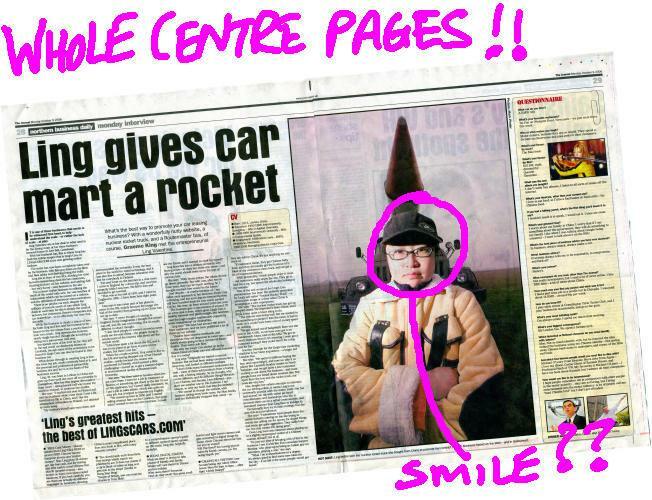 In January 2006, FLEET NEWS, the car fleet operator's trade newspaper said; "(Ling is...) contract hire's Ryanair". LINGsCARS.com gives better service than larger, posher businesses, but I have lower overheads, offer cheaper prices and do more business; and the end result is that people can rent exactly the same cars for less. I spend a lot of my time finding the best deals in the UK, then cutting out most of the larger companies' costs so that my cars are the UK's cheapest, and my service is simply the best. I have over 1000 customer letters published. In 2008, customer Alan Johnston wrote: "The most efficient business I have ever dealt with. Everything done so professionally. Kept totally informed step by step. 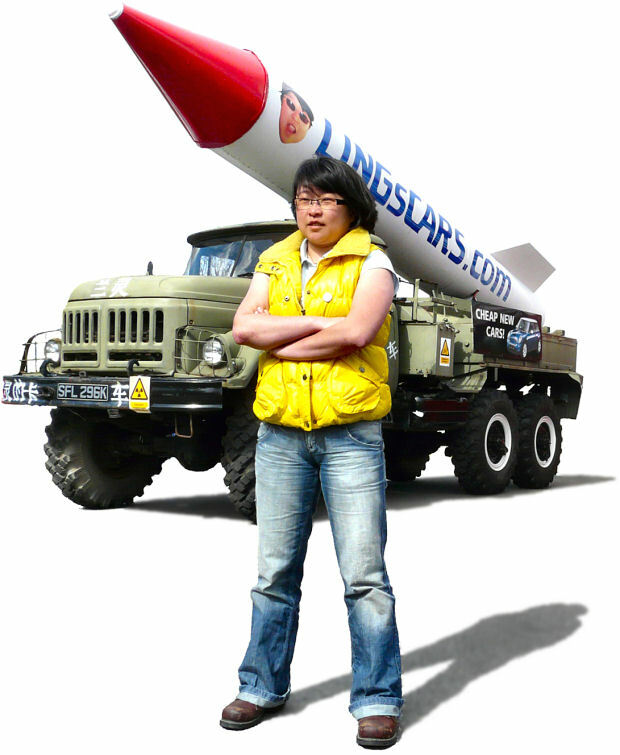 I wouldn't hesitate in recommending LINGsCARS to anyone." Yes. I have plenty of room for expansion. My plan is to double business every year. I am certainly not fully utilised with the level of business I am doing at the moment (between 150 and 250 cars per month). I have moved into a new LINGsCARS World Headquarters building that I have bought, not rented. My investments in the business go into efficiency savings and promotion, instead of dozens of staff. I have a small key team of fantastic people. Many larger companies do what I do, but with many more staff shuffling paper backwards and forwards. I strive to do everything right first time, too. That's my trick to running this business at a good profit whilst undercutting everyone else. It's so simple, but it seems many people want to build organisations of dozens of people instead of doing the job themselves. If the right person comes along, then I would consider taking them on... but my small team achieves more than many larger organisations! I grew up in China, did my middle school (school is SUCH hard work in China, often working until midnight) ...and managed (very difficult, my mum pulled strings) to go to uni in Jinan (Guanzhou) and did Applied Chemistry at BSc level. I was punished in uni because I wouldn't do the morning PE regime. Then I went to Finland because it offered free MSc courses. I arrived in Finland alone with very basic English and stood crying when I arrived at Helsinki airport in January 1997, but survived. I studied wood chemistry (in Finnish!) but flunked it - what a surprise! After marrying Jon and battling with the UK Home Office to come to the UK, I did my Master's in Environmental Quality in the UK at Bournemouth. It was hard, as my English wasn't brilliant at that time. I learned a lot about data and information processing and efficient use of tools, and I use these skills in LINGsCARS.com, if that doesn't sound too ridiculous. It's quite true. What about all the press and publicity you generate? Oh, well, this is a bit of a story, but briefly... I like to publish everything I do on the internet. After getting massive publicity for my Nuclear Missile Truck, the BBC contacted me for Dragons' Den. I really enjoyed doing the show and turned down their offers of investment (mainly because the % investment they wanted was so high), but also because I am not desperate for cash. 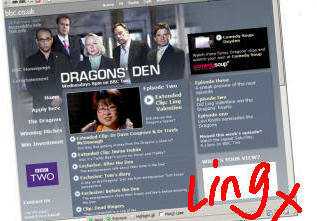 Following Dragons' Den, I appeared on lots of other TV and radio, and now run successful TV advert campaigns. I have also been one of the subjects of a BBC book, and have loads of other invitations for press and publicity opportunities. I make loads of small, fun films... you can see them on this site and on YouTube, and I am often invited to write editorial for things like business directories and blogs. I guess people like a different take on things. 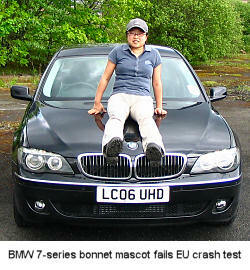 Are you the only Chinese in the UK Contract Hire business? Yes, I think so. I've never met another. Do I get a medal? I'll keep the red flag flying in the motor trade. At least people remember me because of it, but actually I'm quite proud to be Chinese, if not proud of the Chinese government. I tasted tear gas in 1989, although in Chengdu not Beijing. There was much more happening than the Tianamen stuff. One day things will get better, it's actually much better now but still frustratingly "controlled" (anyone been to China will know what I mean), and I hope I'm doing my bit for Anglo-Sino relations. A shame there are no Chinese vehicles to sell in the UK (yet! The joke MG factory Nanjing Automotive has bought will never get its act together, though), but then everyone would moan about having to pedal them along, hahaha. What's your character like, Ling? Oh, I'm hotheaded. I get angry easily and then I shout. You don't want to make me mad. Sometimes I have to really hold myself back if someone is rude or loud on the phone. Occasionally a customer can be really offensive, you know how things happen sometimes - maybe they are having a bad day and then I spring some bad news on them like a delay in car build time at the factory or something. I have been known to tell someone never to darken my website again, but that's very, very rare. Usually I end up great friends with customers! Racism never bothers me, and it's very rare, or maybe I never notice it. I really can't understand people that are so politically correct that they think you don't have a racial identity. I'm quite proud my skin is yellow and my eyes aren't round. Over one billion of us can't be wrong, eh? You should hear how in China we describe English noses, and anyway all the British look the same to me - that is a Chinese joke by the way. I only ever swear in English, not in Chinese. My mum's doing; polite Chinese girls don't swear, you see.